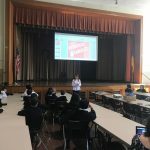 On Friday, Ms. K was provided the chance to help ACS’s middle school students understand the power of eating certain foods and how they can aid their rapidly growing bodies. She made sure they received knowledge about how various nutrients can help them reach their optimal potential. In order to make good choices, one must not only memorize good vs. bad choices, but understand why the good choices are good. Understanding the key nutrients in each food, how it reaches each part of the body from the brain to the muscles, is of highest priority as they transition from children to teenagers. Many nutrition education programs give children and adults the same information about processed foods vs. whole, calories, and fat and how it relates to the obesity pandemic; including obesity related diseases associated with eating unhealthy. However, very few teach how to properly read the nutritional labels: from undertaking where the numbers come from, what they mean, how they relate to each age group, and how each macronutrient, micronutrients, vitamins, and mineral plays a vital role in health maintainers and disease prevention. By doing so, students not only were told why certain foods are better than others, they will also be more conscious about their food choices. They also understood the serious health effects that a lack of certain vital nutrients have on the human body. Consequently, their mindful choices on future food selection is not only because they were told it’s healthy, but because now they understand how certain key nutrients can help them reach optimal strength, health, and brain potential. Lastly, the students were taught how to properly read the ingredients listed in products and why they are in the order they are. More specifically, they were exposed to which ingredients should be avoided and how certain choices are thought to be “healthy” but the ingredients prove otherwise. 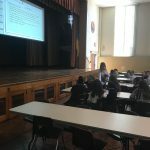 Subsequently, the group looked at sample nutrition labels and Ms. K explained that over the course of the last ten years, people have become more experienced with comprehending them. However, Ms. K said, “that is not to say that we fully understand them.” There are still many hidden ingredients. 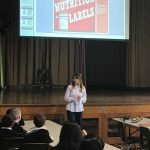 By providing key information the children can now understand and decipher between nutrition labels and thus, between good foods and bad foods. They can also help their loved ones and friends with important information on eating healthy, and prevent over consumption of nutrient lacking foods. Choosing nutrient dense foods that are healthier was the goal of this presentation – IT WAS ACHIEVED!